Watch Deepak Chopra, world renowned writer and founder of The Chopra Center for well being, explain how everything is just energy! Everything around us is a form of energy. An Atom is the most basic, fundamental building block of every single entity that we can perceive. Atoms are made up of sub-atomic particles that are nothing but charges of energy. Multiples of subatomic particles make up an entire atom. This would imply that an atom too is but a mass of energy and space. When something as fundamental as an atom is now seen as a manifestation of Energy, it is but obvious that everything that we perceive around us is also a manifestation of Energy. Animate and inanimate objects around us are all masses of energy vibrating at different frequencies and having their own electromagnetic field of influence. Looking at the bigger picture, the entire planet, our galaxy and the entire universe itself are simply huge masses of energy with a definite form. Everything in this universe is Energy! The core of every single manifestation in our physical reality is made up of energy – that vibrates at a certain frequency. Whether we are aware or not, energy fields exist all around us! It is our conditioning that makes us perceive objects as solids or liquids and give them a unique identity and separateness. But if looked at under an appropriate microscope, one might hardly find a difference between a jug, the water inside and the air around. It is all just energy dancing around in a beautiful, synchronous and unique way to create one small part of a magnanimous universe! Consider a person who has just breathed his last. Biologically the body is still there. The vital organs still function for a few minutes as well. But clinically, the person is declared dead. What has really changed? Everything seemed perfectly functional a few moments ago and yet something changed it all! Science of today has not yet been able to accurately point a finger at the exact phenomenon that causes this transition. But it does recognize that some ‘vital force’ that was present has now suddenly disappeared. This ‘vital force’ that permeates the entire body is called the Energy Body. The energy body is also known as the ‘prana’ and is absolutely essential for life to sustain. The energy body has not yet been biologically ‘located’ or ‘characterized’ till date and hence is referred to as a ‘subtle body’. This is also called the ‘vibes’ one exudes. Others call it a ‘frequency match’ when they sense a high compatibility in their energies. Still others call it ‘charisma’ when a person has such an overwhelming influence on others just by mere presence. Call it as you please, but the fact remains that energies are always dynamically sensing and interacting with each other. Emotions are also energies and influence our energy field/aura. When we are in a positive state, we have a large exuberant aura. When we are in a negative state, our aura shrinks and becomes very dense. That is why we feel very heavy and low when we are sad. A positive energy state is integral to the overall health of an individual. Thus, in the intricate mind-body link, the energy body system bridges the mind and the physical body, thus helping us understand what thought patterns map to which parts and functions of the body. Our Energy body is a very dynamic system. On the one hand we perceive every aura having a definite boundary and being very individualistic, but at the same time one must also be aware that each energy body is entirely energy. Hence, it cannot remain isolated. Interactions take place ceaselessly between energy bodies. There are certain distinct channels, called ‘Chakras’, through which the energy body interacts with other energy bodies around. The word chakra originates from the Sanskrit word for ‘wheel’ since it is constantly spinning to form a vortex. This creates a ‘vacuum’ at the center of the vortex that draws energy of various forms and vibratory frequencies into it. The energies flowing through these chakras could vary from energies of people, to their emotions, right up to various colour or sound frequencies. Every chakra resonates at a certain frequency. And it attracts and radiates energies of those frequencies alone. Emotions too are energies that have a certain fixed frequency of vibration. The same holds true with the 7 fundamental colours of the rainbow (VIBGYOR). 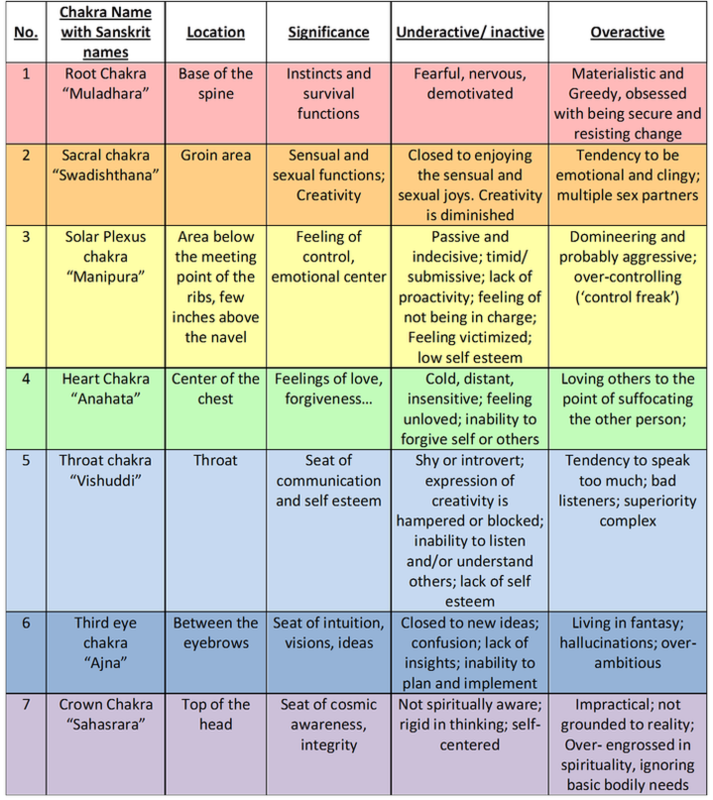 This is why each chakra corresponds to a certain set of emotions that governs our body and is also associated with a certain colour. There are millions of chakras in our body, but primarily 7 major chakras govern most of our energy body. Depending on the flow of energy through these chakras, they can be classified as normal, over-activate, under-activate or blocked. These 7 major chakras govern various core aspects of our daily life. This is essential to understand the nature of holistic healing. The chakras are like bridges that connect our physical body to our mind body. Thus every physical condition is mapped to a certain emotion through specific chakras. Energy flows evenly through our chakras when they are open. Our chakras are open or close based on our thoughts and emotion. When we have a persistent negative thought pattern, the chakra associated with that particular frequency of emotion tends to get blocked. If unattended to, a blocked chakra would eventually seep into the physical body affecting the organs around it. Interestingly, every chakra is directly mapped onto a gland in our physical body (See table below). Therefore, an issue in any of the major emotional traits mentioned above can cause the respective chakra to be blocked. Soon this can manifest as a malfunction in the physical body, either at the gland associated or in any of the organs around the gland. One chakra blocked/underactive can affect even the neighbouring chakras in a chain reaction and can eventually affect the entire energy body itself. In such cases the person often feels extremely depressed or suicidal. Simply working with the chakras and opening the energy flow can help relieve the individual enormously. Opening up the flow of energy into a Chakra is simple! There are a multiple ways in which you can effectively do it. Since it resonates at a certain frequency, there are specific sounds that stimulate the chakra and create a flow in energy. Playing these sounds in your home or while you sleep can open up the specific chakra. Surrounding oneself with the colour associated with the chakra can also open up a specific chakra. For example, sitting in a room with yellow walls can open the solar plexus chakra; Sitting in the midst of lush green grass and trees opens up the heart chakra. Working with the specific emotion/feelings that are affecting the chakra and releasing them can also open a chakra. For example, making conscious efforts to forgive someone who is really affecting you, can instantly open up the heart chakra and save you of many untold physical issues as well! Affirmations work wonders in releasing stored emotions! Taking energy healing with the help of Crystals, Reiki or Pranic Healing (amongst many others) – where the chakras are specifically addressed and cleared. Reiki is a natural form of healing that uses universal life-force energy. The term comes from the Japanese words “rei” which translates to 'Universal', and “ki” which stands for the 'vital life-force' energy that flows through all living things. Reiki healing energy is considered to be spiritual energy that is abundant and freely available to all. Reiki healing was developed by a Japanese seeker of truth named Dr. Mikao Usui. 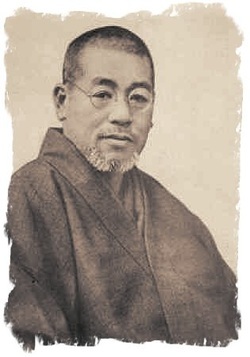 According to some versions of its origin, Dr. Usui brought the Reiki healing method into human awareness in 1922 after a deep spiritual experience. He is said to have begun teaching others after a serious earthquake hit Japan and he felt urged to spread his knowledge to as many as possible. Today Reiki is accepted all over the world as a technique that balances the physical, mental, emotional and spiritual well being of an individual. A Reiki healing practitioner is a conduit of life force energy from the Universal source through his/her hands to the individual receiving the energy. The practitioner is not the source of the energy and therefore does not drain his/her own energies while giving the treatment. One may experience the Reiki healing energy in various ways such as heat, tingling or pulsating sensations at the area where the treatment is applied and one may even feel the energy moving to other parts of the body. This is the Reiki healing energy flowing through you and most people feel very relaxed and peaceful while receiving this energy. Some people may fall asleep during the treatment while some others may not feel anything at all. Whether we are able to perceive the energy flow or not, the Reiki healing energies are definitely flowing and healing the individual nevertheless. Healing support to the client who is receiving traditional medical treatments that are debilitating, such as chemotherapy and radiation, surgery, kidney transplants, etc. Note: Reiki healing is a complement to traditional medical or therapeutic treatments. It is not a substitute for consultation with a physician, a practitioner, natural therapeutics or a psychotherapist. Energy has no restriction to time and distance. Therefore, reiki healing energies can be sent across distances too. The receiver need not be physically present in front of the reiki healer in order for the healing to happen. The specialty of Reiki healing is the 'Attunements' and the use of 'Symbols'. In order for one to become a Reiki healing practitioner, one must be attuned by a master. Reiki is a traditional form of healing and is strictly handed over from a Reiki master to a student. The attunement is a powerful process that opens up the Crown Chakra, Heart Chakra and the Palm Chakras, linking all three with the Universal Source of Energy - rei. The attunement is guided by the rei (Source energy) and reiki students across the world have reported having mystical experiences involving receiving messages, healing, visions and past life experiences. Another unique attribute of reiki healing is the use of Symbols. The symbols are sacred signs that are handed from Master to Student across generations. the symbols used in reiki healing originate from the Japanese system of writing called Kanji. The symbols are charged with healing intent and merely connecting to them through imagination or drawing them in the air invokes the energies and purport of the symbols. However, it has been seen that the efficacy of the symbols increases tremendously after an attunement. If you are interested in learning this wonderful healing technique please do contact us. Pranic Healing is a science that deals with the ability to heal the 'Prana' in a living entity. Experts believe that healing through infusing prana and life-force energy has been practiced in various forms for centuries. The earliest mention of Healing the Prana is found in the 'Chandogya Upanishad'. Modern Pranic Healing was largely introduced to the western world by a prolific writer and theosophist named William Walker Atkinson under the pseudonym Yogi Ramacharaka. However, the great teacher accredited to actually bringing this ancient science down to the masses is Master Choa Kok Sui. He called it the 'Science' and 'Art' of healing. Master Choa classified the body into two parts - the visible body and the invisible, bioplasmic body. This bioplasmic body is what we refer to as the Energy Body consisting the Aura and Chakras. Pranic healing is the technique of healing the visible body by catering to the bioplasmic body and allowing the body to go through its natural processes. There are two body-laws, as put down by Master Choa, that are the basis of Pranic Healing. These are natural laws that have always governed the Human Body. Unfortunately over time these laws have been forgotten by most people. Tapping into these laws can show miraculous changes in the body. 1. The Law of Self Recovery : The body knows how to heal itself from any condition afflicted on it. to deteriorate and fails to heal itself. 1. 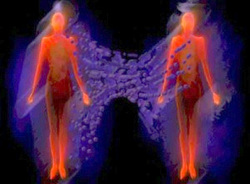 Scanning : Using the bare hands, the aura or energy body of the individual or diseased part is scanned. The blocks, congestion, depletion and damage in the aura and chakras are made note of. 2. Cleansing : Maser Choa says that majority of an illness/disease can be healed by merely clearing the blocks and negativity in the Aura and Chakras. Using the hands, specific sweeping techniques are used to cleanse the bioplasmic field of the specific organ or the entire body. Managing simple health conditions such as flu, viral fevers, especially with children. Preventive health. The moment a health threat is perceived, measures could be taken to cleanse and clear the aura/chakras of the ill effects. As a complementary to conventional medicine/treatments, pranic healing has enhanced recovery or response to many complex surgeries and medical procedures. A lot of chronic conditions have been controlled and even healed completely with the regular cleansing and replenishing of the Prana. Shielding of the aura and chakras from 'energy vampires' and foreign energies. One of the specialties of Pranic Healing is the in-depth understanding of Prana or Life-force. Master Choa illustrates the nature of different types of Prana and its uses. Therefore, for different situations, there are different types of Pranas that could be used to serve different purposes. The easiest way to discern various frequencies of prana is through colours. Pranas with different colours have different properties and frequencies. Each colour of prana produces a particular healing effect, in a particular way and at a particular pace. For example, violet prana has the ability to transmute dense, negative energies into lighter positive vibrations. And so on with other colours as well. The thorough understanding that Master Choa has provided has today influenced many other schools of healing as well to take to colours as a therapeutic tool. Energy has no restriction to time and distance. Therefore, pranic healing energies can be sent across distances too. The receiver need not be physically present in front of the pranic healer in order for the healing to happen. Consider this: You are driving down on the highway when suddenly a stray driver swerves dangerously onto your path. As if that were not enough, he starts shouting at you for not looking out! You are on the verge of blowing your top but somehow manage to hold on to your horses. Eventually, you might move past that moment but probably still feel a little irritated as the day passes by. In such a case, it is likely that you are still holding on to some energy from the negative interaction on the road. If you are holding on to the negative energy long enough, you might even notice everything going wrong for the rest of the day! This is a crude example, but a very real phenomenon. We come across hundreds of people, places and energies everyday – whether we are aware of them or not. And more often than not, we pick up different types of energies and get affected by them. Every time we go through a negative experience or emotion, the aura cracks. And just as a wound on our body heals, these cracks too automatically heal. However, when we go through a negative emotional pattern repeatedly, the aura has no scope to heal and slowly develops a ‘void’ or 'weakness' in our being. These voids can be very subconscious and are like open wounds that attract microorganisms. Foreign Energies now get attracted to these voids in our auric-space and influence us from there. Foreign Energies are therefore those energies that afflict the energy body of an individual, that are not his own. A void can be filled with positive or negative energies. The most basic and simplest form of foreign energy is the various emotional patterns of people we meet (known/unknown). Assume that an individual has a void in his aura that has been caused as a result of repeatedly losing his temper. This void can be filled by the anger of every other angry person who responds to his anger in addition to his own. As a result, the short-tempered person only feels more enraged! Or in a different scenario, the void can be filled with the loving reassurance of a loved one. That is, every time the angry person has to calm down he needs to listen to the loving words of the dear one. In either case, the individual is not acting out of his own energy/emotional grounds. He is either continually angry because of other people’s anger energies, or he is relaxed because of someone else’s loving energies. Just as energies of known and unknown living people fill up our voids, in more intense cases, energy fragments of dead people (known/unknown) can also fill our voids. When a 'lost' soul or soul fragment is intentionally targeted to living people's voids by tantrics or witches, it is termed as Black Magic or Voodoo Magic. (More about these stronger negative energies is discussed in the next section on Spirit & Black Magic Release). Over time, people become dependent on foreign energies! The reason is simple. Sans the external energy, they probably would have to face the onset of their weaknesses and voids on their own. Holding onto foreign energies (subconsciously) gives them the leeway to cloak their weakness. They feel a pseudo sense of completion. When the foreign energy is negative in nature (as in the case of the angry driver on the road), one would feel unduly justified in behaving negatively whenever triggered. If the foreign energy is positive, from a loved one, the individual would even demand that his weakness be acknowledged and accepted by the loved one! And until then, he would continue in his spate of negativity. What then would happen if the loved one were not around? Would he continue to be in a negative state till he/she returns? Each one of us, as humans, is the most powerful being in the universe. No external entity can affect us in any way unless we allow it to – be it the love of a dear one, the anger of our colleague, the energies of a dead relative or an unknown force sent through black magic! Our vulnerability lay in our voids. It is only when we have an unhealed part in us that we even allow a foreign energy to occupy our space. Carrying Energies of another being is unhealthy! It neither gives us a chance to address our voids and complete ourselves with our own energies; nor does it allow the true owner of those energies to feel complete. Just as thought forms and emotional energy of people around us can become a part of our own energies and influence us unfavourably, in certain cases, the energies of people who are no longer a part of the physical reality too affect us. 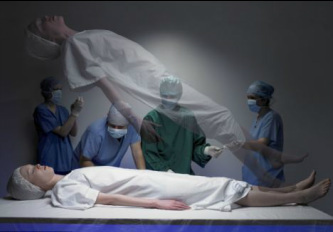 At the time of death, the physical body is left behind and the soul/etheric body of an individual rises. The etheric body consists of the residual emotional patterns and thought patterns of the individual. As soon as the etheric body separates from the physical body, there appears a doorway known as the Bardo (click here to know more about the Bardo) that helps the deceased soul to exit the physical realm into the light. However, certain times the etheric body of an individual does not deem it fit to exit the physical realm. The reasons could be innumerable. The most common of them are ignorance, strong attachment to the physical realm, fear of going to hell, addictions, revenge, jealousy or a sense of unfinished business. Whatever be the reason, the fragment of the soul that has stayed on continues to feel all those emotions in the same intensity and suffers as a result. This is why many religious texts prescribe that the ‘dying thoughts’ of an individual must be pure. It is only with a positive state of mind at the time of death that the soul can see the light and move on. The Bardo remains open only for a limited period of time. Once the Bardo closes, this soul fragment is stuck in this realm without a body. It is purely a form of energy now. Hence, it looks for resonance in other 'living' energy bodies. When the soul fragment resonates with an emotional pattern of an individual in any way, it finds its way into the void of the individual and starts to experience its own pent up emotions in a new body! 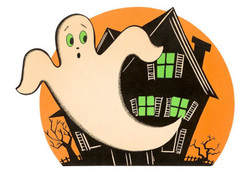 A Spirit can occupy an individual’s energy body through his voids or it can occupy his physical body itself. Both cases result in a wide spectrum of physical, emotional and mental conditions that can range from migraines to suicidal tendencies. They are usually stronger than stray foreign energies and very often amplify our own negative emotions. Have you ever felt like someone else takes over when you are mad with rage? Spirits often use our body and life-situations to vent out their revenge or anger or whatever other lower emotion they predominantly feel. 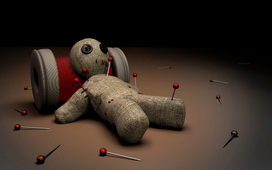 ‘Black Magic’ or 'Voodoo' is a term that has a lot of fear associated with it. Some people even believe that once a victim of black magic, there is not much one can do to get back to a normal life. We would like to begin by saying that black magic is very real across many different cultures. Just as healers use positive energies to heal, black magicians use negative energies to harm. While a regular foreign energy or spirit might get attracted to us by resonance, in black magic cases, there is a ‘sender’ who intentionally sends a negative force into our physical or energy body. This ‘dark force’ is programmed to perform a certain harmful role. 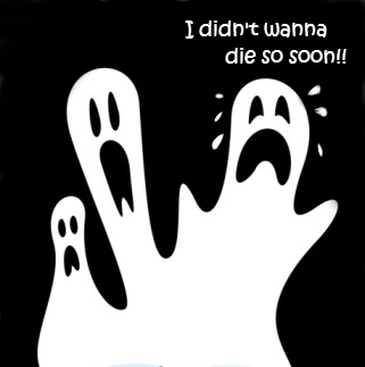 Spirits that have got trapped in the physical realm after their death feel lost and miserable. These helpless spirits are captured by Tantrics and used for their ulterior motives. The spirits are wrapped in layers of darkness of ignorance, and used as Dark Forces. As we have mentioned earlier, any form of external energy can affect an individual only if he has a weak energy body filled with voids. One who regularly keeps his emotional and energy body in a balanced and positive state (through regular physical exercise, yoga, dance, meditation etc) need not fear being possessed. When involved in a road accident or similar intense trauma. In women, during the Menstrual period/ miscarriage etc. Releasing the Spirit or the Dark Force is not a dangerous or frightening process like how they show in the movies. In fact it is a gentle communication through the language of unconditional love. The process involves bringing the spirit/Dark force into the light of knowledge, making it aware that it does not rightfully belong to the physical realm and urging it to leave. At Violet Hues, we work with Hypnotherapy, Regression Therapy and Theta Healing to release the Foreign Energies. 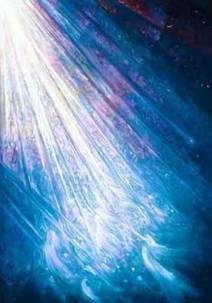 Thereafter, we help heal the voids that attracted these foreign energies in the first place. Once the voids are healed, the energy body and chakras are further strengthened, sealed and shielded using Pranic Healing, Reiki and Crystals. Please Note that we are not equipped to heal and work with extreme and violent cases of "Tantrik" practices. If we do feel that a certain case of Black Magic or Possession is beyond our domain of work, we would recommend that you meet with someone who is trained in the field of Yantra, Mantra and Tantra.